Strengthening of pre school education and ECCE Day in AWCs during the month of October 20: Attention is invited to subject and reference cited, it is to inform that ECCE(Early Child Hood Care, Education and Development) day is an important service component in ICDS. The AWCs deliver this service to 0-6 year's children through child care stimulation. growth and developmental milestones monitoring and promotion, supplementry nutrition and monthly ECCE day intervention and also home based guidelines to parents of the 0-3 ycars children. 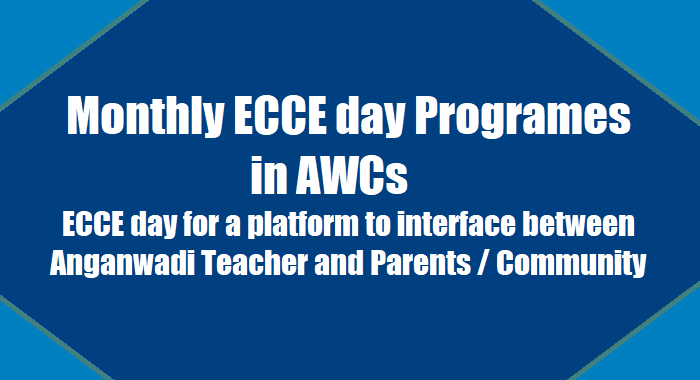 In this regard, it is to inform that the Department fixed monthly ECCE day for a platform to interface between Anganwadi Teacher and Parents / Community. This prngramme involves ICDS functionaries. 0-6 years children parents, community, PRls, CBOs and primary school teachers frorn School Education Department etc will he involved in the programme. Further, it is lo inform that every month an issue will be discussed with parents /community members on ECCE. This month the department is organizing ECCE day on "School Readiness Utsavam" on 28.10..20l7 in the every AWCs. Hence, it is requested to issue suitable instructions to the District Education Officers (DEOs) to ensure participation of the primary school teachers and bring awareness to the parents and community on the importance of school readiness in children before joining primary school.